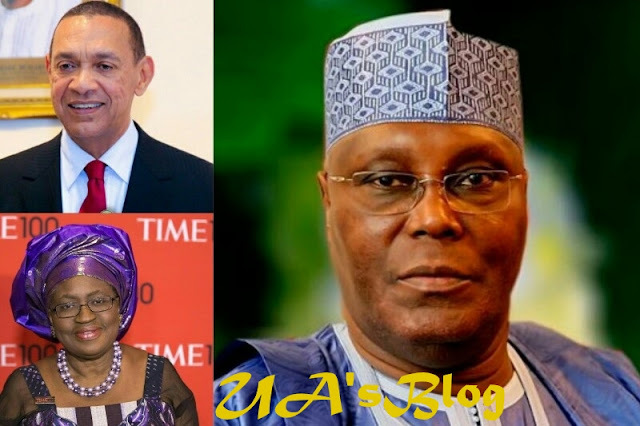 Chief Chinedu Eya, a Chieftain of the Peoples Democratic Party (PDP) in Enugu state, on Sunday congratulated the former Vice President, Alhaji Abubakar Atiku, following his emergence as the presidential candidate of the People’s Democratic Party (PDP), while calling on him to choose the country’s former finance Minister, Dr Ngozi Okonjo Iweala or Senator Ben Murray-Bruce, representing Brass Senatorial zone of Bayesa state as his running mate, to give technical coloration to his aspiration. Chief Eya, a former Enugu North senatorial aspirant on the platform of PDP, who spoke after a keenly contested primary election of the PDP, at the national convention of the party held at the Adokiye Amasiemeka stadium, Igwuruta-Ali, Port Harcourt, Rivers state, congratulated the party’s delegates for their bold decision during the exercise. Chief Eya noted that his choice of the two candidates mentioned above were to allow front-line technocrats in the country the opportunity to chart a new course for the Nation’s bastardized economy under the APC in one term. In a statement by his media aide, Gwiyi Solomon, the PDP chieftain urged the other presidential aspirants who participated in the primary election to happily accept the outcome of the contest and rally round the chosen candidate of the party as the tasks ahead of the general election will be daunting. “While I congratulate our delegates for a good job, I also want to beg other contestants in the exercise to hug Atiku and become ‘Atikulated’ as the tasks ahead of the coming general election will no doubt, appear very daunting;” Gwiyi quoted Eya as saying in the statement.